Civil War (also known as the Pharsalia) must stand as a contender for the weirdest and craziest epic poem of all time. I recommend reading the introduction below first, then reading through the commentary posts in order. Lucan’s Civil War: Erictho the Witch, the Necromancer, etc. Lucan was a Roman poet who lived from 39 to 65 AD, forced to commit suicide at age 25 when he was found to have been involved, along with his literary mentor and friend Seneca, in a plot against his patron Nero. He had been remarkably productive to that point: Civil War is all that survives, but there’s mention of at least a dozen other works. Civil War was never finished: it breaks off in the middle of Book 10. It is vastly different from the Iliad, the Odyssey, the Aeneid, and the Metamorphoses. Homer, Virgil, and Ovid all dealt with mythical material in the distant past. Civil War chronicles the chaos of middle-first century BC, when Julius Caesar crossed the Rubicon to invade Rome, displacing his former ally Pompey and the Senate. After great battles against Pompey’s armies across the whole of the Roman state, Caesar briefly became supreme ruler of Rome before being assassinated. Dissolve the engines of the broken world. Allot the height of honor. Lucan chronicles the bloody war with sarcasm, disbelief, and a subversive attitude toward all tradition. The Greek/Roman gods of those other epics are nearly absent, replaced by the fickle and frequently sadistic Fortune, as well as a multicultural array of superstitions and divinatory practices. Though the material is primarily historical, taking place barely 100 years in the past, Lucan tosses in ghosts, spirits, the underworld, witches, and more. He utterly defies the linear and/or episodic nature of the earlier epics, shifting frequently between multiple plotlines and adding in loosely related interludes of both historical and mythical material. twisting and turning events, and chance rules mortals. the minds of men be blind to future fate. Leave them free to hope within their fears. The poem feels stunningly modern, because so much of the values and rhetoric it invokes are immediately undermined and questioned. The non-linear narrative and drastic shifts in tone, coupled with Lucan’s frequent sarcasm and very black humor, conjure a world that is falling apart civically, ideologically, and spiritually. It was and it wasn’t. With Nero’s suicide 68 AD (after having killed his mother and driven several generals into open revolt), another Civil War ensued in Rome. It was followed by the self-explanatory Year of the Four Emperors, before the reasonably competent emperor Vespasian stepped in and set the stage for another hundred years of comparative stability for the Roman Empire, including a couple of the best emperors Rome would ever have (Trajan and Hadrian, who ruled twenty years each from 98-138). From Lucan’s perspective, things looked far worse. Being so close to Nero could not have made him anything but pessimistic and fatalistic. It’s worth comparing Lucan to his obvious antecedent Virgil, who wrote the Aeneid for Augustus, just as Lucan wrote the Civil War for Nero. Arguably, each got the epic they deserved. The Aeneid sets the founding myth of the Rome in place to anchor Augustus’ founding of the Roman Empire in tradition. Civil War tears it to shreds, just as Nero was the last of Augustus’ dynasty to rule the Roman Empire. Virgil waited until the age of 40 before starting on his epic, dying just before making final revisions. Lucan started in his early 20s and still did not live to come close to finishing it. Lucan and Seneca were hugely influential on Renaissance poetry and drama, the Greeks not having gained the prominence they have today. Both ostensibly subscribed to Stoic philosophy; both wrote extremely bloody literature. 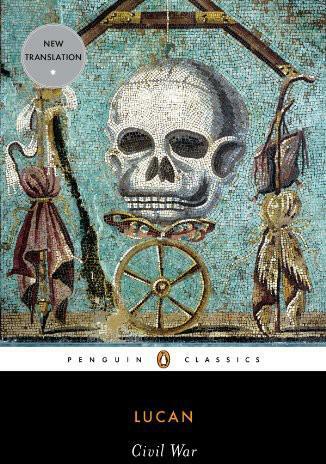 Seneca’s plays have always felt too artificial and one-dimensional to me, but Lucan’s fervid creativity and chaotic inspiration make Civil War gripping and frequently mystifying. It captures the raw chaos of existence as well as Kleist or Celine. It is a work of inspiration in the most literal sense. Nicole at Bibliographing and I did a joint reading of Civil War (aka Pharsalia). Nicole’s introduction is here; my entries are listed at the top.